Denna produkt ger dig 53000 bonuspoäng. Ånglok med tender klass 038.10-40 typ DB, version med Witte rökdeflektorer, loket har mfx digitaldekoder, högeffektsdrivning, ljudmodul, drivning på 3 axlar, inbyggd rökgenerator, ljusväxling i färdriktningen, underhållsfria varmvita LED lampor, minsta möjliga radie 1020 mm, längd över buffertar 64,5 cm, epok IV. 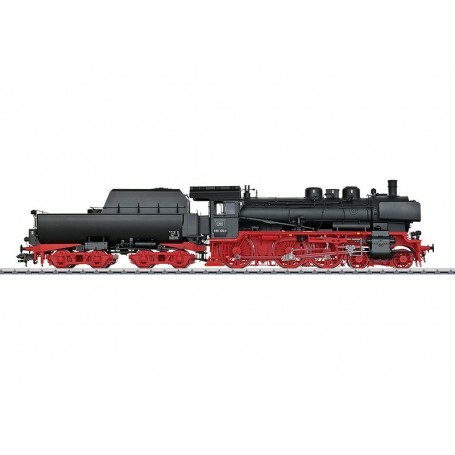 Model: The locomotive has a frame, superstructure, tender, and applied parts constructed mostly of metal. This is a highly detailed model with many separately applied parts and a detailed engineer's cab. The buffer warning stripes are modelled on the locomotive. The locomotive has an mfx digital decoder, controlled high efficiency propulsion, and a sound generator with operating sounds synchronized with the wheels as well as extensive sound functions. It can be operated with AC power, DC power, Märklin Digital, and DCC. 3 axles powered. The locomotive has a built-in smoke unit with smoke exhaust and cylinder steam synchronized with the wheels. The triple headlights have a light color correct for the era and change over with the direction of travel. The headlights and the smoke generator will work in conventional operation and can be controlled digitally. Maintenance-free, warm white LEDs are used for the lighting. The locomotive has engine cab, firebox, and running gear lights. The locomotive has a reproduction of the prototype coupler on the front and a system coupler on the rear of the tender. An accessory package with a reproduction of the prototype coupler, a claw coupler, a figure of a locomotive engineer and a fireman, and smoke fluid is included with the locomotive. Minimum radius for operation 1,020 mm / 40-3/16'. Length over the buffers 64.5 cm / 25-3/8'. Prototype: German Federal Railroad (DB) class 038.10-40 steam locomotive with a tub-style tender and with Witte smoke deflectors and 3 boiler domes (steam feeder dome, sand dome, steam dome). Inductive signal magnets and inductive boxes. Former Prussian P8. Road number 038 958-5, Stuttgart District, Rottweil Sub District. The popularity and recognition of the technology in the Prussian P8 is reflected in the fact that about 300 units were still in use in Era IV after 1968. Right up to the end of regular steam operation, they were representatives of this mode of propulsion that could still be experienced often. The individual models differ significantly in detail from each other due to technical changes during the locomotives' long building period and also due to later overhauls and conversions during the operating period of these locomotives. This is the special charm of each individual locomotive of this class for every steam locomotive fan. Inductive box and inductive magnet modelled on the locomotive. Highly detailed metal construction. A smoke generator with smoke exhaust and cylinder steam synchronized with the wheels included. Operating sounds synchronized with the wheels and controlled by the load. Smoke box door with many original details can be opened. Two-color fire box flickering light. Hinged water tank cover, can be opened prototypically from the engineer's cab. Randomly controlled steam exhaust from the safety valve. Headlights with a light color correct for the era and warm white LEDs.Running gear lights and engine cab lighting included.mfx decoder for operation with AC power, DC power, Märklin Digital, and DCC.7.5 kilograms / 16 pounds 8 ounces weight (locomotive 4.6 kilograms / 10 pounds 2 ounces), Length of the tub-style tender 28.9 cm / 11-3/8'.